I removed something from my blog today. Well, from the sidebar, actually. All right, all right — that is hardly the Times relaunching, I am aware of that, but it is still noteworthy for two reasons : one, it was the most recent addition there. Two, I removed it as a matter of, well, exorcism will have to do. 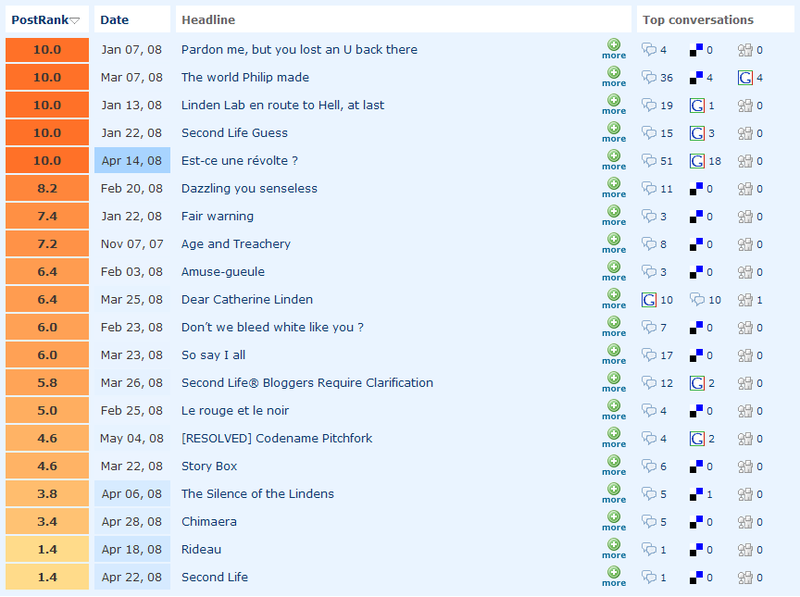 The item I removed was a pretty inconspicuous link to the aideRSS ranking of my blog’s feed items. I you missed Kit Meredith’s post extolling its virtues, aideRSS is a free web service that will swallow your blog’s feed (any feed, really, it doesn’t need any kind of subscription) and, after some rumination, spit out a ranking of your posts, which it calls PostRank. The FAQ tersely states that « PostRank™ is a scoring system that we have developed to rank each article on relevance and reaction [my emphasis]. ». The idea is to define sub feeds of, say, the top 10 % posts, so people can subscribe to these instead of the whole feed. Which sounds rather neat. So what’s wrong with it ? I mean, I can more or less agree on the inclusion of four posts among the top five. The reaction numbers (which aideRSS computes from the number of comments, Google blog search hits, Diggs and del.icio.us bookmarks linking to your post — although oddly enough, its count is slightly off from the ones the services themselves provide) are mostly corroborated by the reader statistics of wordpress.com. The fifth one, my interface rant, is the odd man out. Obviously, that is one case where aideRSS does its magic computing relevance. Independently from any feedback numbers. So why remove the link ? Was I miffed by some patent pending, trademarked Google-ish algorithm showing me it knows more about my posts’ relevance than I, as the author, do ?